Ultrasonic Inspection and Leak Detection Reliability Direct, Inc. Your Direct Source for Reliability, Maintenance, Test & Measurement! Ultrasonic inspection detects the ultrasonic sound created by leaks, turbulence and friction in industrial equipment. This turbulence generates strong ultrasonic components which are heard through headphones and seen as intensity increments on the meter. It can be generally noted that the larger the leak, the greater the ultrasound level. Thus, ultrasonic inspection equipment can pinpoint compressed air leaks, vacuum leaks, refrigerant leaks, worn bearings, internal leaks through valves and steam traps and electrical anomalies such as arching, tracking and corona. Ultrasonic inspection may also be used to observe lack of lubrication and prevent over lubrication of bearings. Reliability Direct, Inc. offers a wide variety of ultrasound instruments from basic analog models to sophisticated digital instruments complete with software manage your data, and help you analyze, trend and report your test results. Please Visit our Knowledge Base for more Information on Ultrasonic Inspection! Our most popular low-cost ultrasonic leak detector. 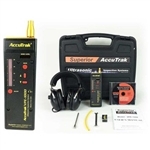 The Superior AccuTrak® VPE-2000 is the first digitally controlled ultrasonic detector. HOW ULTRASONIC TECHNOLOGY WORKS FOR YOU. The Ultraprobe senses high frequency sounds produced by operating equipment, leaks and electrical discharges. It electronically translates these signals by heterodyning them down into the audible range so that a user can hear these sounds through a headset and see them as intensity increments on the meter. UE Systems UP3000LRM Ultraprobe 3000 Long Range Module Kit is fully equipped to detect energy waste, and locate mechanical and electrical problems. UE Systems UP3000SC Ultraprobe 3000 Stethoscope / Scanner Kit is fully equipped to detect energy waste, and locate mechanical and electrical problems. UE Systems UP3000S Ultraprobe 3000 Scanner Kit is fully equipped to detect energy waste, and locate mechanical and electrical problems. The SKF TMSU 1 is a high quality, user friendly, sensitive instrument enabling the detection of air leaks by means of ultrasound. The Whisper Ultrasonic Leak Detector will allow the user to check for pressure and vacuum leaks where other sniffer style leak detectors can't go, to the 40.5 kHz range.